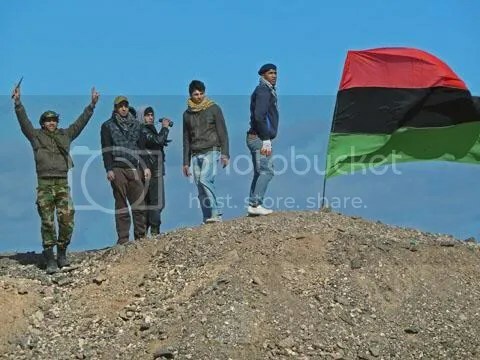 Libyan rebels. Source: Voice of America. “With only weeks of fighting experience, they lack an understanding of the fundamentals of offensive and defensive combat, or how to organize fire support. They fire recklessly and sometimes accidentally. Most of them have yet to learn how to hold seized ground, or to protect themselves from their battlefield’s persistent rocket and mortar fire, which might be done by simply digging in. And their numbers are small. Officials in the rebels’ transitional government have provided many different figures, sometimes saying 10,000 or men are under arms in their ranks. Any NATO strategy that relies on the rebels to militarily break the stalemate isn’t going to succeed. Qaddafi’s forces are proving themselves to be much better organized and more ingenuitive than the rebels, and are apparently adopting unconventional tactics in a successful attempt to avoid NATO close air support assets. Despite their enormous personal bravery, the rebels’ lack of a command structure seems to have prevented them from adopting even rudimentary military tactics and adapting to their tactical situation, despite having been in combat for over a month. If NATO sticks to its commitment to avoid boots on the ground, the rebels are likely not going to be able to take advantage of coalition air support and win decisive victories to force an end the civil war. This is troubling. It’s an open question how long domestic politics are going to allow France, the UK, and US air power to remain committed in Libya, and any war of attrition longer than a few months will favor Qaddafi’s forces, who are more disciplined, better equipped, and more numerous. Given the rebels’ lack of formal command and volatile moral, it’s not impossible that if the war lasts much longer individual fighters will begin to reconsider their chances of victory and go home, potentially fatally weakening rebel defensive capabilities. Until NATO is willing to be realistic about the capability discrepancy in Libya it doesn’t have an exit strategy.